Electric scooter parked on a sidewalk. Seven scooter companies have expressed interest in coming to Massachusetts, according to the Metropolitan Area Planning Council (MAPC). If proposed legislation passes, electric scooter rentals may soon return to Massachusetts. 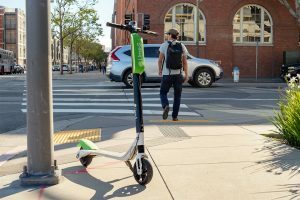 Bird – a start-up scooter company – flew in and out of the state last year on a failed test run. Since then, many communities have been discussing regulations locally while waiting for action on the state level. Last month, Gov. Charlie Baker delivered, including electric scooters in his road safety bill, calling for them to be regulated similar to bicycles. Like cyclists, scooter riders would be required to wear helmets to protect themselves from head injuries.